A few of the packages I got this week. I love getting mail. These past 2 weeks, my customers fueled my giddiness in opening fresh, new packages with envelopes from Nevada, Virginia, California, and Florida. All of the envelopes contained horse hair. In the next few weeks my fingers will be flying to make pulls, plait all sorts of pretty braids, and turn these packages of horse hair into beautiful wearable jewelry. There are a few steps before the creation phase can begin. First is wrangling the hair together. 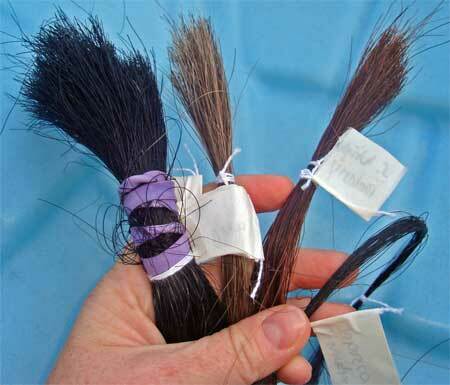 I tie off the horse hair at intervals using kite string. Why kite string? I have no idea. It was there in the draw one day and it works well, so I stuck with it. Tying the hair prevents tangles and makes it more manageable when I’m separating it into pulls. This is also the step where I label all the horse hair so that Jack Frost’s owner doesn’t get Tabasco’s hair. A camp cookwear set I inherited serves as my horse hair cleaning set up. I don’t mind the smell, but I don’t think the family appreciates it, so I save indoor horse hair cleaning for the depths of winter. After the dunk and a rinse in cold water, the horse hair is off to the washline to dry. My neighbors must find this amusing. In the next few blog posts, I’ll show you how the hair goes from bundle to bracelet, but first a few other notes about getting your horse’s tail ready for a custom piece. How much hair do I need for a custom piece? I get this question all the time. The Shopping page has more details on this, plus shipping, sizing, etc. I recommend sending a shock of hair the width of your thumb and at least 14 inches long for a bracelet. This gives me more than enough hair to work with. The hair is usually not of uniform length. Lots of smaller hairs at the top of the bundle are too short for bracelets so that’s why I ask for such a big bundle. From that I’m able to tease out the longer hairs for a bracelet or two. This photo shows many different-sized clumps of horse hair. The black bunch on the right is way too little hair. This is the only hair the owner had from her horse, and I’m hoping to eek a bracelet only because the strands are very thick and this tail is extremely long (43 inches!). The two bunches in the middle are fine for a bracelet or two (if all the hair is the same length). There will be little if any hair left over. The black bunch on the left could probably yield 3 to 5 bracelets, depending on the length of the hair. When you send me the package (remember, I love getting those! ), I suggest a method that includes a tracking number. This is especially true if this is the only hair you have from your horse because you no longer own it or it passed away. I ship U.S. Postal Service Priority Mail. This method arrives in 2 to 3 days and has a delivery confirmation option, usually for free, if you ask for it. Delivery confirmation won’t tell you every stop along the way, it only tells you the date and time it arrived at its destination. 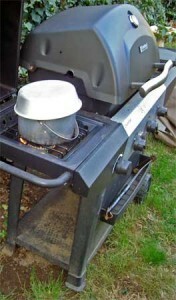 Delivery confirmation can be added to letters and other packages for a fee. You can also use FedEx or UPS, which has tracking numbers with all of its packages. The Horse Hair Jewelry page show you the different styles of bracelets I offer at this time. Many customers request special embellishments, so I’ve begun posting custom pieces on Flickr so you can get some ideas for other options. You’ll find it at www.flickr.com/redtaildesigns. In the future I’ll put a direct link on the home page to the Flickr site. I’m off to start some horse hair jewelry! 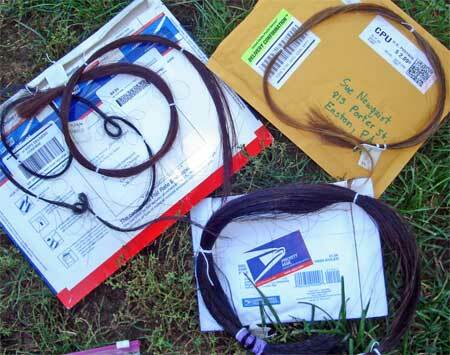 This entry was posted in About, Horse Hair, Jewelry and tagged horse hair, Jewelry, shipping by Susan. Bookmark the permalink.